Our firm filed the brief of Free Speech Defense and Education Fund as amici curiae in support of petitioner in American Target Advertising, Inc. v. Francine A. Giani, Division Director, Utah Division of Consumer Protection in the United States Supreme Court. The brief argues that Utah’s Charitable Solicitations Act is unconstitutional. 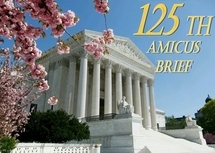 The Free Speech Defense and Education Fund was joined by 47 co-amici.